Over the years I have gotten many requests for how to make a baked chicken. So often many of us buy those roasted birds in the grocery store and let me say, they taste fantastic, I love to pick them up from time to time. Did you know it is easy, actually very easy to make a baked chicken? If you have never cooked before, I promise, you can make a delicious roasted chicken. Looking for an inexpensive dinner that will impress people, this recipe can be your standby. I am going to share with you, how you can impress your guests, by preparing a homemade dinner. Making cooked chicken may seem confusing if you have never done this, but it isn’t. It takes about 10 minutes to prepare this recipe, and then you put it into the oven, and you can forget about it for about 50 minutes. You can put the chicken in the oven, set the table, have a glass of wine, and prepare the rest of the meal while your creation cooks. There are several reasons why I like to make a baked chicken from scratch. The first is I get to season it the way I want. I often run by the produce department or take a look in my container garden to see what’s fresh. I also get to choose my chicken. I love kosher chickens. If you have never tried a kosher chicken, you are missing something. Kosher chickens are from Kosher butchers, they are cleaned more thoroughly, and to me, the meat always tastes sweeter than a regular poultry. Enough talk, let’s talk about roasting this bird! While this chicken was cooking I made some simple mashed potatoes, and then I made a little bit of gravy from the juices that were in the bottom of the pan, and I served a simple dinner. Next time you run to the store, consider picking up a chicken and baking one on your own. I bet you will like this more than the ones we see sold at the grocery store. 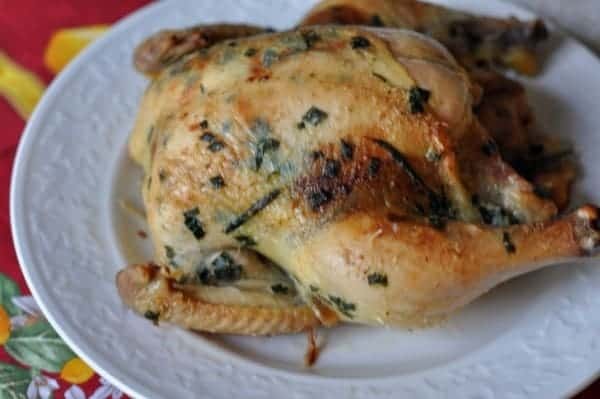 A homemade baked chicken can be just as juicy, and even more delicious than a store bought baked chicken. Did you know it is super easy to make a baked chicken? Preheat your oven to 350 degrees. Remove chicken from wrapping, rinse the chicken in the sink, if there is a "goodie bag" inside the cavity, remove it. We all have accidentally baked the livers and gizzards in the chicken exactly once. I normally discard the livers and gizzards, but you may want to fry them up. Prepare a compound butter by placing the butter and seasonings into a small bowl, mix well. Cut lemon in half, and squeeze 1/2 of the lemon's juice into the compound butter. If you really like lemon, add a little lemon zest to the compound butter. Chop herbs of your choice and add those to the butter. I have made this with chives, rosemary, and thyme, and combinations of those three. If you are going to use rosemary, use only about a tablespoon or the rosemary will dominate the chicken. Now, carefully place the compound butter between the skin and the chicken. You can separate the skin from the chicken easily by simply reaching in and spreading your fingers. Spread the compound butter starting at the breasts, and then over the drumsticks. You are likely to have some butter left over, spread remaining butter inside of the chicken cavity, and onto the outside skin. Place the chicken breast side up into a baking dish. 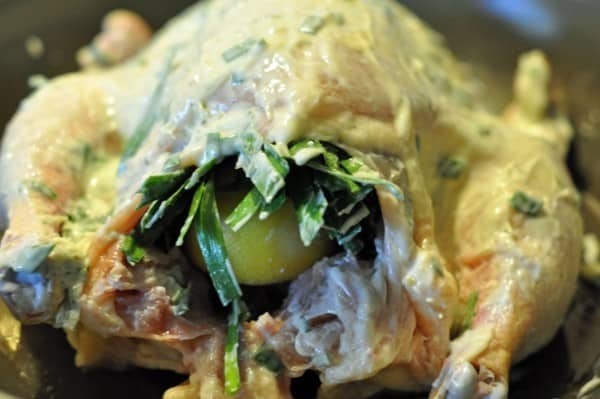 Put lemon halves inside the body of the chicken, and if you have any herbs left over you can add those inside of the chicken cavity as well. By now the oven is fully heated, and you can place the chicken into the oven. Bake for about 50 minutes. Check chicken for doneness with either a meat thermometer by placing into the thigh, chicken is done at 180. Or, if you do not have a thermometer, cut the chicken slightly at the thigh and see that the juices run clear. Remove chicken from oven, and let it rest for about 10-15 minutes. Letting the chicken rest is actually crucial to a moist chicken, if you let the chicken rest, you will have a moist chicken because all of the juices flow back through the meat. Why would anyone throw out perfectly good livers and gizzards? I come from South Central Pennsylvania (Penna. 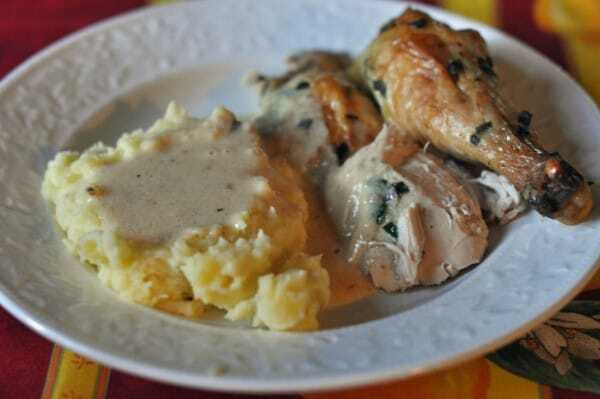 Dutch Country) and we cook the necks, gizzards, and livers with chopped onion and celery, and salt and pepper and make giblet gravy with the meat drippings and some of the giblet water to serve over the mashed potatoes and the chicken. That’s incredible, I had idea you could do that. I always wondered what that big white metal box in the bin room was for. I am glad you enjoyed the roasted chicken, it is one of my stand by meals. Another trick you can do is – don’t put butter under the skin. Instead, cook the chicken upside down. Turn it the right way up for the last 15 minutes of cooking to crisp the skin. The theory is the fat melts down and soaks the breast meat, keeping it moist. There’s really nothing as good as a roasted chicken for comfort food. And the carcass is awesome in soup after. Guess I’ll be buying a chicken this week since I’m out of stock and I need quick to prepare lunches and dinners with this new schedule, so a baked chicken is on my list! Yours looks DEElish! This looks fabulous! I usually mix a little olive out into my compound butter on my roast chicken, but I hadn’t considered adding lemon. I’ll definitely be trying that soon!